A Fanfare for Tony was written for the inaugural conference of the British Association for Music Therapy, and first performed there on 21st February 2014 by students of Birmingham Conservatoire of Music. This is a slightly shortened version, suitable to be played at any celebratory occasion. The fanfare is scored for ten brass instruments and timpani, and was written in memory of Prof. Tony Wigram (1953-2011), a pioneer in the field of music therapy in the UK, and well known internationally both as a therapist and for his research and writing on the subject. 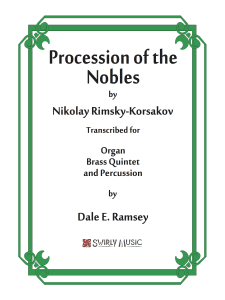 The piece contains a number of passing references to music therapy songs, and quotations from music strongly associated with Tony’s family, including a Danish folksong (introduced by the four trombones), and a theme from the Organ Symphony by Saint-Saens. A short fugato section leads to a triumphant ending, featuring the German hymn tune Nun danket alle Gott. Includes score and full set of parts.